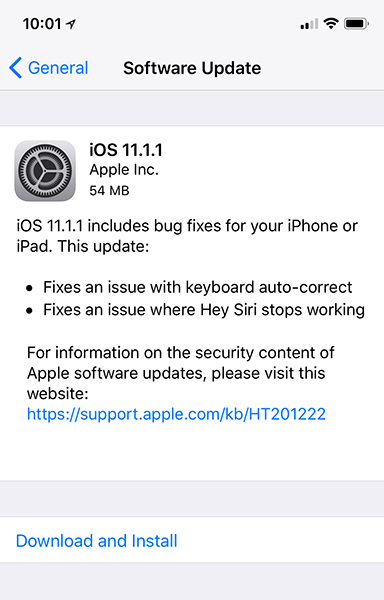 iOS 11.1.1 is now available for the iPhone and iPad, and it focuses on fixing two specific bugs. First is the autocorrect bug that’s causing some devices to replace “i” with “A[? ]”, and second is a bug that makes the “Hey Siri” hotword stop working. This is a relatively small update, so it shouldn’t take long for you to download it and rid yourself of these bugs. Go into Settings > General > Software Update on your iPhone or iPad to begin the update process. The letter “i” is a pretty common thing for people to type, so it’s easy to see how this auto-correct bug could get pretty annoying pretty fast. If the bug has been affecting you, go grab iOS 11.1.1 to rid yourself of the issue.